Alan Robert Vinitsky, MD is a doctor in Rockville, Maryland who sells strange tests, diagnoses, and treatments at his clinic “Enlightened Medicine”. He has been disciplined by medical boards in Maryland, Pennsylvania, and New York. The above statements have not been reviewed with the FDA or any other medical organization, and are not intended to imply a documented scientific basis at the present time. According to his web site, Vinitsky charges new patients $450 per hour and established patients $400 per hour. He also sells a $75 for $100 “deal” and gift certificates on Yelp. 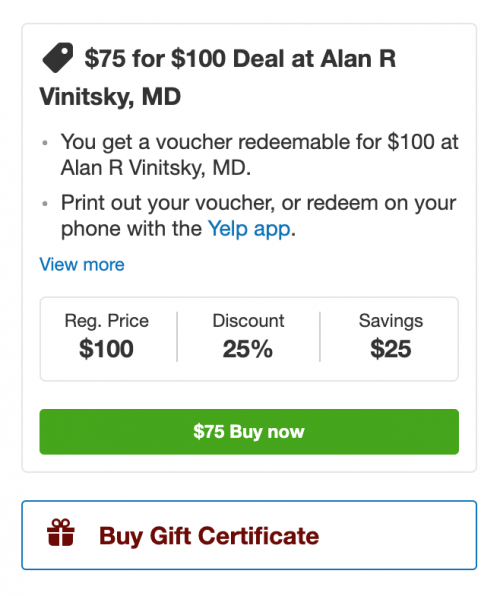 In 2018, Maryland Board of Physicians reached an agreement with Vinitsky in which he would be disciplined because—with respect to nine patients—he “failed to meet the appropriate standards as determined by appropriate peer review for the delivery of quality medical care”, in violation of the Maryland Code. Incredibly, out of the ten of Vinitsky’s cases that were subject to independent peer review, nine failed to meet standards for quality medical care in prescribing Controlled Dangerous Substances (CDS). i. Fails to consider the results of UDS for subsequent prescribing. The Board reprimanded Vinitsky and permanently restricted him from prescribing Controlled Dangerous Substances and from issuing written certifications to patients for medical cannabis treatment. He also was placed on probation for a minimum of one year. In 2019, the New York Office of Professional Misconduct charged Vinitsky with professional misconduct because of the 2018 disciplinary action in Maryland. Vinitsky agreed not to contest the allegations and was disciplined. He was placed on probation for 3 years and had restrictions placed on his ability to prescribe controlled substances. In 1995, Maryland Board of Physician Quality Assurance found that Vinitsky allowed individuals to perform x-rays and ultrasound who were not authorized do to so in Maryland. The Board concluded that Vinitsky’s actions “constituted the practice of medicine with unauthorized persons or aiding unauthorized persons in the practice of medicine,” in violation of the Maryland Code. In the Consent Order agreed by the Board and Vinitsky, Vinitsky received a reprimand and a $10,000 fine. Because of the action in Maryland, Vinitsky was also disciplined by the Pennsylvania Board of Medicine and New York Office of Professional Misconduct. The Pennsylvania Board placed Vinitsky on probation. The New York OPMC sustained a charge of professional misconduct against Vinitsky and suspended his license to practice medicine.